This tightrope balance had been central to the Jerzy Andrzejewski novel upon which Wajda’s film was based. It is worth reflecting, therefore, on why more Poles took Wajda’s film to heart than had embraced Andrzejewski’s novel. Did visuals offer more leeway for an ambiguity that could fool the censors, as Wajda himself has argued? 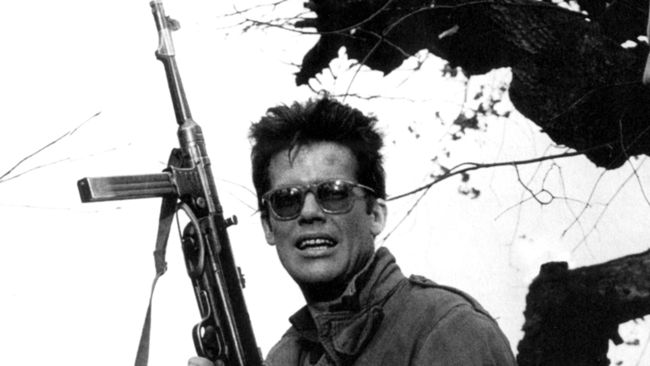 Was Zbigniew Cybulski’s electrifying performance the key factor? Or was it Wajda’s transformation of Cybulski’s role into the undisputed focal point of the ironic tragedy whose twenty-four-hour period was the hinge connecting the end of one (world) war to the start of a new (civil) one? Perhaps the distinguished novelist Maria Dabrowska was right to say at the time that it told as much of the truth as could be told in the circumstances. Such praise may suggest a work partially tainted at source, and Wajda himself appears to endorse this view in his post-1989 The Ring with a Crowned Eagle (1993), a corrective echo of the earlier endeavor. Filming in 1958, Wajda was, of course, working in the aftermath of the liberalizing 1956 “thaw,” otherwise known as “the Polish October.” But there were limits to the freedom it brought, and the very recent nature of that change, combined with the artist’s canny awareness of the possibility of a renewed freeze, make it hardly surprising that both the film’s opening and its ending—in which the charismatic Maciek stumbles to his death on a rubbish dump, curling up unglamorously in a fetal position, legs twitching as if to kick death away—should be so compatible with the state’s denunciation of the Home Army. That opening shows Maciek and his companion Andrzej lounging in the grass, but the camera’s slide down from a chapel’s cross suggests a fallen world. That suggestion will be spelled out graphically later in the film, when Maciek enters a ruined church with his one-night lover, Krystyna, and an image of Christ crucified hangs upside down between them. Shortly thereafter, the camera will slide down again from Maciek to the corpses of the men he killed earlier, recalling the time before he was a sympathetic figure. As he and Andrzej attempt the assassination of a newly installed local party secretary, Szczuka, they catch the wrong men, and Maciek’s tommy-gun eliminates one at the chapel’s door. The fire his bullets ignite on the man’s back is the infernal result of his teeth-baring ferocity, and the opening appears calculated to compromise him both with the Communists whose representative he is seeking to kill and with Polish patriots shocked by his sacriligeous indifference to the presence of the chapel. Yet even here he is an uncomfortably real figure, disturbed by the ants—just one of the Buñuelian elements of this sequence—crawling across the gun he had laid aside in the grass, not a simple stereotype of the assassin as reactionary Other. In retrospect, moreover, any inhumanity in him can be read as the imprint of the war that is all he has ever known and that has damaged his perspective as well as his sight. The sign of that damaged vision is found in the dark glasses that do double duty as a realistic image of the effects of wandering in the sewers as a Warsaw Uprising insurgent (here Wajda evokes his previous film, Kanal) and as the symbol of late-fifties existential cool. Maciek has one foot in the existentialism of resistance, another in the existentialism of fashion. Zbigniew Cybulski, who plays the part, was often called Poland’s James Dean, though his fused toughness and boyishness seem to make him both its Dean and its Brando. Cybulski’s performance electrified Wajda, who described it as the film’s uncensorable essence. The film’s careful architecture builds parallels between Maciek’s damage by the struggle and that of Szczuka, who becomes the father he cannot have and who himself has lost his son, Marek, brought up to fight with the other side and caught fighting with the partisans. It is the urgency of Szczuka’s desire to see his son that causes his death, prompting him to walk before the arrival of the car ordered to take him to Marek. Instead, he meets the son’s Oedipal double, the one willing and able to kill him. Maciek and Andrzej may be given the film’s best-known scene, in which they light glasses of vodka, suggesting votive candles, to their fallen colleagues, but Szczuka is allowed a similar reminiscence of Spanish Civil War comrades—and nostalgic political songs accompany both scenes. The question of whether the balance is merely apparent, its even-handedness a smokescreen for stronger allegiance to Maciek, goes to the heart both of the work and the controversy around it, as it can be argued that we are not so much with Maciek as with Cybulski, and simply because of the greater power of his performance. Having failed to assassinate Szczuka at the beginning, Maciek is ordered to complete the job. The chance that frustrated him once threatens to do so again when he meets the barmaid Krystyna and what both had intended as a one-night stand opens vistas to a possible peaceful future—to dreams of study, normality. But army discipline requires a fulfillment of orders, and he kills Szczuka in the dark, though even at the last minute he paces up and down before the hotel, his mind racing over whether or not to follow his target. As his victim falls dead in his arms, the embrace is an ironic image of the impossibility of unity within Poland and between the generations. And as the fireworks rising above them illuminate a scene that shows there is nothing to celebrate, in another irony, no one perceives the flashlit crime. As in tragedy, the death within the family gives the lie to the idea of a national family, to the hotel porter’s hanging out of the national flag. If, for all its tragedy and multiple ironies, the film exhilarates, it is through the power of its artistry and because the authority of its synthetic image of the postwar Polish dilemma does indeed tell as much of the truth as could be told—as Dabrowska had said. The artistry is not confined to Cybulski’s performance or Wajda’s compression of Andrzejewski’s more leisurely novel and list of dramatic personae into a tightly knit, twenty-four-hour confrontation. It is also continually present in the deep focus of cameraman Jerzy Wojcik, which both underscores the ironies and evokes the oppressiveness of a history with whose cruelty Poles had become all too well acquainted. Characters are betrayed by what they cannot see—as when the foregrounded Andrzej telephones the major to report mission accomplished as Szczuka enters the hotel lobby in the background—while the ever-visible ceilings above the characters’ heads embody the limits on their actions, the fact that something always bears down upon them and constrains them. The film’s taut, packed, slightly fevered air flows to a large extent from a doubling that affects both imagery and characterization. Much of the imagistic irony derives from the title, whose source and import are given when Maciek and Krystyna visit a church and Krystyna partly deciphers an inscription in which nineteenth-century poet Cyprian Norwid asks whether the remains of chaos will be ashes or a diamond. Fire bursts from the back of the man Maciek guns down at the chapel door; Maciek lights the glasses of vodka, as well as Szczuka’s cigarette; and just after he has shot at Szczuka, fireworks light up the sky. Doubled imagery links Maciek and Drewnowski, both associated with the white horse that represents Poland. Thus, although these characters appear opposed, with Maciek denouncing Drewnowski’s careerist double game, this linkage suggests both greater complexity and Wajda’s possible own partial (merely tactical?) underwriting of the official view of the Home Army underground. After all, there are further links: Drewnowski’s fire extinguisher spraying the Monopol banquet guests echoes and parodies Maciek’s initial killing; the two actors—Cybulski and Bogumil Kobiela—had been co-conspirators in the Bim-Bom student cabaret. Tellingly, Maciek is running away from Drewnowski’s call when he bumps into the soldiers, carries on running, and is shot. This particular doubling underlines the complexity in Wajda’s position, which is also a dilemma. So if he boils down Andrzejewski’s novel into a tragedy with an Aristotelean unity of time, place, and action, it is also one that corresponds to a Hegelian model of tragedy that may be seen as standing Marxism on its head: in that model, of course, tragedy is precipitated not by any flaw within a character but by the collision of two figures, each of whom advocates a one-sided good. Tragedy becomes a matter of situation, not character. After all, in Szczuka communism achieves a nobility that critiques the pettiness of the film’s prewar nobility, bent only on survival and self-aggrandizement. The rift between opposed goods then bifurcates Maciek, who desires both normality and love and obedience to army discipline. The conflict is one between the claims of brotherhood in arms and an individual desire that includes the sexual (Krystyna’s naked back is quite daring for both period and place). But the rift seems also to run through Wajda himself, who echoes the Communist authorities’ derision of the prewar order of the older generation (“the democratic press” is represented by the drunken Pieniazek) but also sees the new era in the same terms as Pieniazek: as one in which the scum comes to the top. By the end, the most positive figure in the new order is dead, and—as if the embrace in death had pulled him deathward, too—Maciek loses both his chance at a new life and then life itself. The possibility of national rebirth is mocked by the fetal kicking of his death spasm on the rubbish dump and by the parallel scene of the hotel revellers’ hypnotic drift at dawn, a restaging of the paralysis besetting would-be rebels at the end of Stanislaw Wyspianski’s fin-de-siècle play The Wedding. There are only ashes, no diamonds. Paul Coates is a professor of film studies in the Department of English and Film Studies at the University of Aberdeen, Scotland. His publications include The Gorgon’s Gaze: German Cinema, Expressionism, and the Image of Horror (1991), Lucid Dreams: The Films of Krzysztof Kieslowski (ed.) (1999), and the forthcoming The Red and the White: The Cinema of People’s Poland.